Spoilers ahead for The Handmaid's Tale Season 2, Episodes 1 & 2. Alexis Bledel's character Emily's fate was uncertain at the end of Handmaid's Tale Season 1, and at the beginning of Season 2 it kind of still is, in a different way. After a bloody attempted getaway from Gilead in Season 1, Emily is punished by being sent to the Colonies. But The Handmaid's Tale's bleakest location yet is still a bit of an enigma. Episode 2 of the newest season of the Hulu series depicts a world that audiences have heard about before, but not seen. Not all executions in Gilead are carried out by hanging or firing squad, it seems: Moira, if you'll recall, chose to work at Jezebel's, an illicit brothel, over this particular fate. But some women, including Emily and Janine, are sent to die slowly in the Colonies. In Margaret Atwood's book, the Colonies are areas of North America, or what used to be called North America, that have been destroyed by nuclear bombs. "Unpeople," and in particular "unwomen," have been sent there to do the laborious task of cleaning up the area before they ultimately die of disease. In the epilogue of the source material, a professor teaching Gilead history mentions that some of the unpeople were sent to pick cotton or harvest produce. The show so far hasn't dropped too many clues about where the Colonies are located. Janine arrives there by bus in Episode 2 and greets Emily, and we know both of them came from what used to be Boston, but that doesn't rule out the possibility that they could have first traveled by plane or boat. A fan-created map of Gilead using textual evidence from Margaret Atwood's novel The Handmaid's Tale estimates that the Colonies run through the Southeast of the country from Virginia to Louisiana. 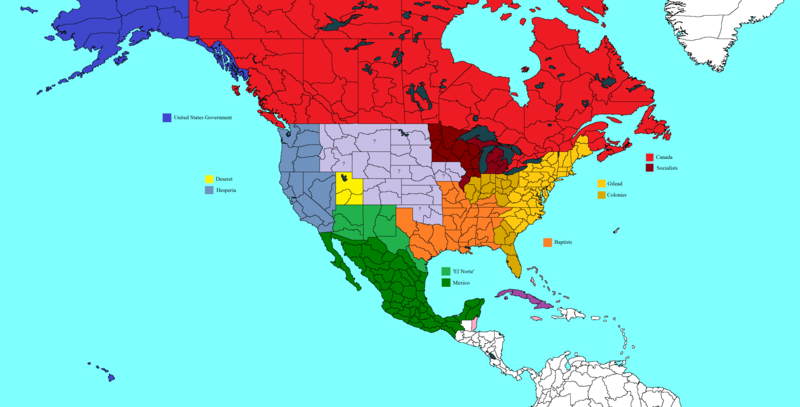 Another fan-created map of Gilead suggests that the various Colonies may be isolated in former states like Texas, Georgia, Michigan, and even New York. A third map, from user jacobspartan1992 on Reddit, places one part of the Colonies in what used to be Florida and Georgia, and another comprised of parts of Indiana, Ohio, Illinois, and Kentucky. So, it's not entirely clear where exactly the Colonies are — but if the center of Gilead is New England, it makes sense that the line of demarcation would be somewhere South and/or West of there. In an interview with TVGuide, above, creator Bruce Miller talked about how the Colonies affect Emily in particular, as the audience has already seen in Episode 2. "I don't think your time in the Colonies can affect you any way but poorly. Knock down your confidence in other human beings. But I think for Emily, exposes some survival instincts in her that she didn't know were there." And the show's creators consulted real resources for building this area. "We did a lot of research on labor camps," Miller added. "Everything from the Holocaust, to Gulags, prison labor camps in China, and to see what kinds of experiences those people had when they got out." So, that's potentially good news, if some characters manage to escape the Colonies this season. For now, at least, Emily and Janine have to make the best of their situation... which is pretty dire as of now. “The Colonies are horrible. They’re an extrapolation of how [Gilead thinks] about women as disposable,” said Miller during a Handmaid's Tale Paleyfest panel, according to Deadline. And, though the horrors of the new regime and what some of these women went through before going to the Colonies has not been forgotten, there is a community in this far corner of Gilead, and these women may survive this bleak location yet.